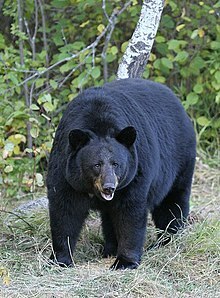 Ursus americanus est species ursorum communissima, in America septentrionali indigena. Hic ursus est plerumque niger. ↑ Garshelis, D.L. ; Crider, D. & van Manen, F. (2008). "Ursus americanus". IUCN Red List of Threatened Species. Versio 2008. International Union for Conservation of Nature. ↑ Ursus americanus, Mammal Species of the World, 3a ed. Vicimedia Communia plura habent quae ad Ursum americanum spectant. Vide Ursum americanum apud Vicispecies. Novissima mutatio die 28 Aprilis 2017 hora 18:30 facta.